THE NATURE OF FLY FISHING is change; it’s a system in flux. As such, it continuously presents a caster with new and creative casting challenges. Often that means throwing something other than those bullet-straight casts you’ve practiced for years; they shouldn’t be the only tricks up your sleeve. Sometimes you need to throw the fish a curve — a curved cast, that is. Although this casting stroke actually can turn right, left, up, or down, most right-handed casters throw left-curving casts more easily because they have more wrist flex and control in that direction. It feels more natural. A right-curving cast, though, thrown by a right-handed caster, is one of the more difficult casts to master in all of fly fishing. Whichever direction you choose, the curve cast is a valuable addition to your casting quiver. Use it to deliver a fly to a fish inaccessible due to structure or stream current. Many uses for a good curved cast reveal themselves as you become more accomplished at throwing it. I use a skip curve to deliver flies under mangroves and other low hanging foliage. Its brother, the underhanded curve, is a useful tool for dry fly fishing. The underhanded curve directs the leader and fly straight up at the very end of the cast, allowing them to fall down to the water in soft coils. This effect is achieved by a throwing a side-arm cast with a quick upward flick of the wrist at the end of the cast. Figure 2 shows the corresponding rod flex and unflex of a curved cast. Again note that that the greatest flex comes forward of the heavy perpendicular line. Note that the length and speed of the delivery phase, the speed-up-and-stop, is shorter and faster than in the standard side-armed cast represented by Figure 1. Opposite the delicate underhanded curve is the tuck cast, or overpowered-overhead cast. Throw this cast when you want to drive your fly down into the water column to overcome current or to make the fly ‘dive.’ With this curve cast you’ll need a heavier tippet and shorter leader. While it’s not a particularly delicate presentation, the tuck cast does get the fly down and can be essential when nymphing. Most casting strokes can be divided into two inseparable phases which fluidly melt into each other. In the first, the loading phase, a caster slowly, smoothly lifts and accelerates the rod tip, causing it to bend in resistance to the friction from the line. A slow, smooth speed-up of the rod tip is the key here. The second part, the delivery phase, occurs near the end of the stroke, when most of the fly line has escaped the water. The delivery phase is characterized by quick acceleration over a short distance to a controlled stop. The second phase creates a deeper bend in the rod, which further loads it with energy. When the rod stops, that energy transfers to the fly line in the form of an unrolling loop. Imagine drawing a straight line that moves in the direction exactly opposite and away from the target/fish. That’s the path your rod tip should travel. Call it the ‘line of the cast.’ A straight line is, after all, the most direct route between any two points. In most efficient casts, the caster moves the rod tip in a nearly straight line, both in the back and forward strokes. The straight path of the rod tip creates a loop which unrolls and lays out parallel to the line of the cast. It creates a straight cast. See Figure 3. Figure 3: The line of the cast is the path the rod tip follows on both the back and forward strokes, represented by the arrow. The fly line mimics the movements of the rod in the final moments of the stroke. In the horizontal curved cast, the fly line, leader, and fly follow the same straight path on the back stroke. The changes come on the forward stroke, where the caster begins the loading phase by accelerating smoothly over a slightly longer distance. Then, as the rod tip passes well forward of the vertical point of rod perpendicularity, the caster applies increased speed over a relatively shorter distance (see Figure 2). The effect overpowers the cast and causes the leader and fly to flip over, creating a curve. A right-hander casting side-armed can throw a left curving cast by speeding-up and stopping short in the cast. Try it. The degree of the curve can be augmented by additional wrist snap to the left. It’s easy; nearly everyone can manage an adequate left curve. The right curve cast is, as they say, a whole ‘nuther story. Some casting books advise making a conventional overhead back cast, then twisting your wrist to the right at the very moment of the speed-up-and-stop motion. Frankly, I find this motion unnatural, cumbersome, and awkward. For a right curved cast, the angler makes a cross-body back stroke, angling the rod at about 45 degrees. Here the caster begins the forward stroke. In Photo 2, the caster performs a fast, abrupt stop and simultaneously rotates (twists) his wrist to the right. 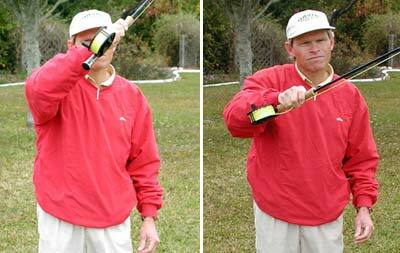 Here’s a far easier method: Make a conventional high, cross-body back cast, where your right arm crosses your chest diagonally and the rod angles up between your head and your left shoulder, for right-handed casters. This should put the rod angle at somewhere near 45 degrees. On the forward stroke, begin the loading phase slow and smooth. Stay on track, in plane through the long loading phase, then bring the delivery stroke to a fast, abrupt stop, slightly twisting your wrist to the right at the same time, delivering a powerful stop-stroke. Again the rod stays tilted across your body at roughly 45 degrees. This will overpower the cast the same way you did for the left curving cast. The family of curved casts are specialty casts — casts that you will use for a specific purpose. Each time you learn and master a specialty cast, your general casting skills improve — a peripheral benefit of the learning process. But that mastery comes only from practice. Practice is how you convert casting knowledge to catching know-how; it’s how you make your casting tool do what you want, when you want. Then you can catch that elusive fish by throwing it a curve.